I made two new hats! 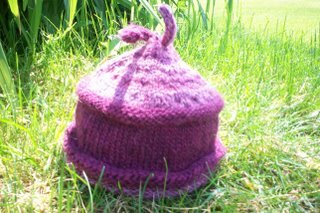 The first one is called "Solrunn's Hat" and it is an Erly Baker pattern. 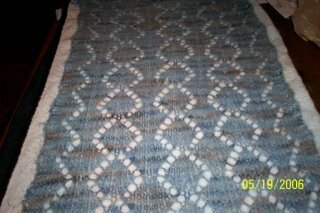 It was done with a handspun wool from the NHSWF and some Light Lopi which just happened to match. You can't really see it that well, but the bottom has two rolled hems, the lower one in the multi-colored handspun and the upper in the Lopi. I liked the colors a lot in this one. 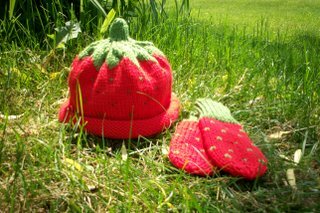 The second hat is the Anne Norling Fruit Hat done in Knitpicks Merino Style colors of strawberry (naturally!) and asparagus. The wee thumbless mittens are my own pattern. 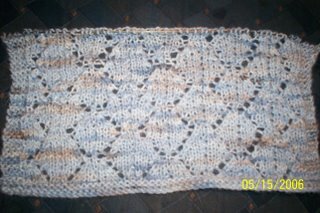 I really liked this pattern a lot and it knit up really quickly--like, a-few-hours-from-cast-on-to-weave-in-ends quickly. I'm thinking how cute a top-down sweater would be to match this. Alas, I'm out of strawberry-flavored yarn. And I've got other stuff on the needles to work on for awhile. I had a lovely long weekend. My best friend from college came up and we had a great time! We stayed up waaaaayyyyyy too late talking on Friday night, and morning came early. We went up to MJ Grittles for breakfast, ate too much, then went home and collected my sister and took her to Lowe's to price her kitchen cabinets. THREE HOURS LATER she got her estimate on paper and a really great design to look forward to. The Bug was a patient little girl and got herself a prize for not having a meltdown in a long, three-hour wait at the home center. With no toys, mind you. So, we were going to go out Saturday night, but decided to play it low key instead. I made some burgers on the grill and we sat around after the kids went to bed and talked and laughed and stuff. I got up bright and early to go to the 8:00 mass on Sunday, and when I got back we went to Nashua to see our friend Lennie. Len teaches color guard and they rehearse in the parking lot of the mall. We grabbed him for lunch at Smokey Bones and sister and I laughed so hard that we had indigestion. Some ginger cookies from Trader Joe's set us to rights, though. Oh, this is Lennie. Need I say more? So, we got home and threw some steak on the grill and had another cookout. It was cool and comfortable under the weeping willow. We discovered that Grey Goose is pretty good in TJ's sparkling lemonade and that the Market Basket steak tips are faboo. Stayed up too late again, and pretty much couldn't get out of our own way by Monday morning. But we rallied and went to Joann's, picked up some silk flowers and headed out to the cemetery to visit the dead relatives. Bob stayed until just after two, and now I miss him awfully. And I'm still tired from the weekend. I just got myself a shop at Etsy. 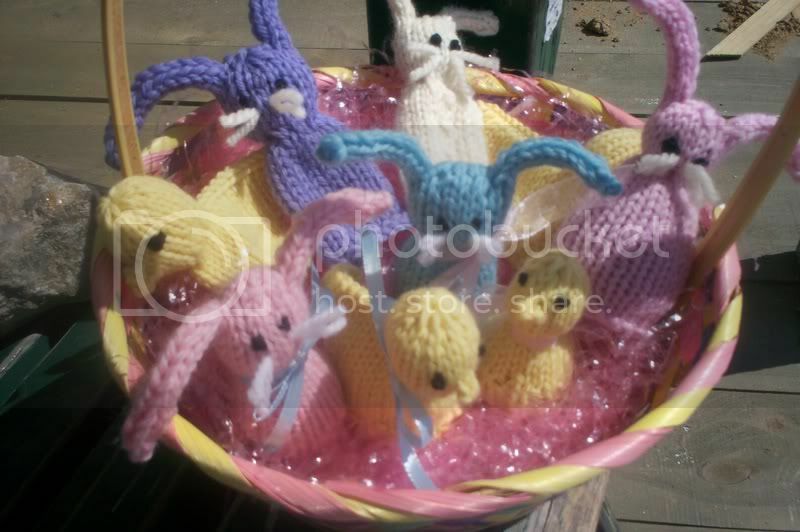 For those unfamiliar with the site, it is sort of like an online craft fair. Handmade stuff for sale, without the hassle of auctions. I've listed all my mittens for sale. I plan to sell them at craft fairs anyway, and if I can move a few pair from the comfort of my kitchen, well all the better for me! My shop is Shop Poops, Please. I did have a fun Memorial Day weekend, and as soon as the pics are shuffled and arranged and taken I'll regale you with my tales of debauchery. Or lack thereof, as the case may be. I got two hats done to show you too, so I'll get those up as well. 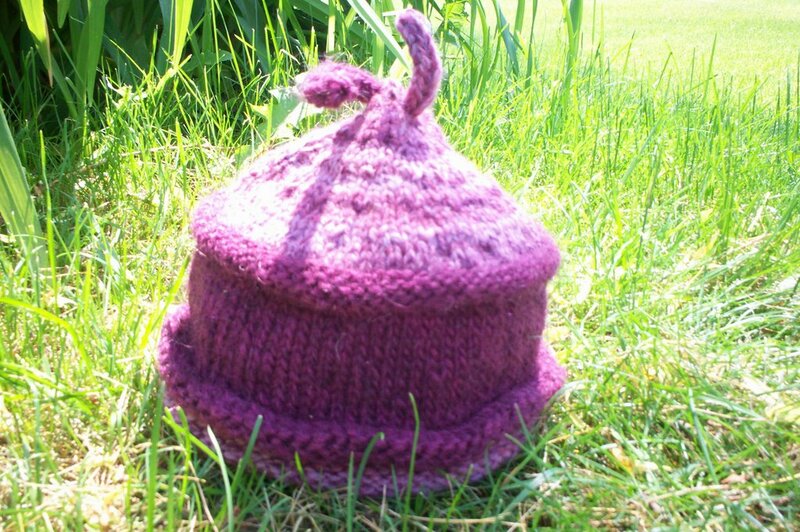 Still hung up on file hosting so that I can share free patterns. I'll keep on looking, though, fret not. I know why they call them "slippers". Because they're slippery on wood floors. Unless you "no-skid" the bottoms, which I don't do. Yet. 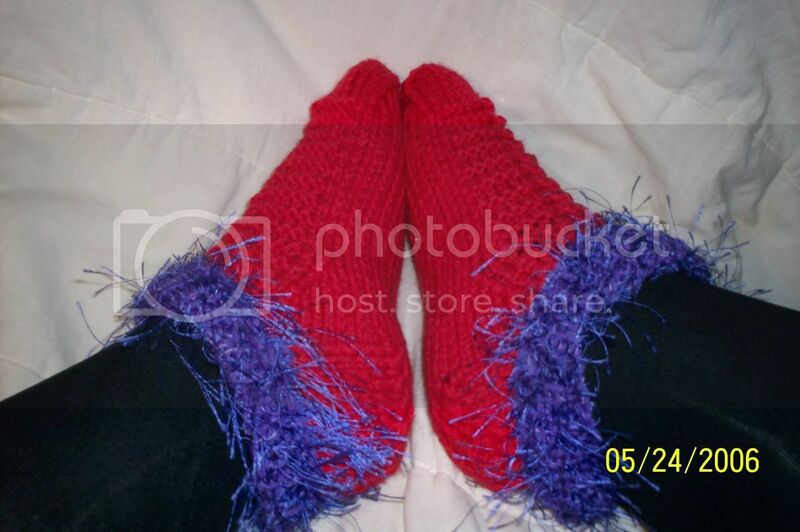 So I will call my creations "slipper-socks" or as my Grammie used to call them, "bedslippers". I made these for one of the ladies in the choir. 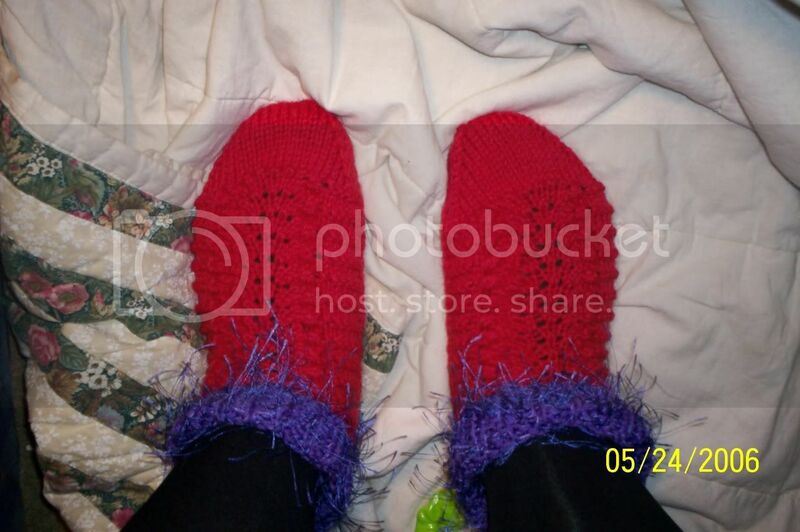 Someone on the Knittyboard suggested that when I made a pair for the director that everyone would want some. Well, not everyone, but they did get some oohs and aahs, and when Martha said she wanted some I just couldn't say no. Because I love Martha. And because she wants a pair to show off to her "red hat" ladies. So she got her own pair of "red hat lady slippers." Or "pied-sous" as they're known in my neck of the woods. Anyway, they're made with Knitpicks Wool of the Andes in red for the foot and the cuff is KP's Merino Style in iris with a strand of KP's Butterfly Kisses in lilac carried. The heel and bottom are slip-stitched for comfort and the top of the foot is the ever-popular "fan" pattern. I shall wash and block them and give them to her at mass tonight. Got all excited to put up a couple of free patterns for you, only to find out that the file hosting thingy I used wasn't up to the challenge. Goddamn fine print. Back to the drawing board tomorrow, I guess. In the meantime, if anyone has a site they use to host their files and would love to drop a name, I'd appreciate it! If you cast your glance to the left, you'll see where they'll be. Soon, I hope. Anyway, it pretty much rained all day and it was cold on the side of the mountain. I figured as much, and had I known how cold, I'd have skipped the stole and taken an afghan off the back of the couch. And I wouldn't have been the only one wearing it. But weather woes aside, it was a lovely wedding and a fun reception. A good time was had by all and we were woefully tired by the time we went to bed. I'd post more, but it will have to wait for later as I just finished printing the wedding photos to give to the happy couple at the brunch we're attending in less than an hour. 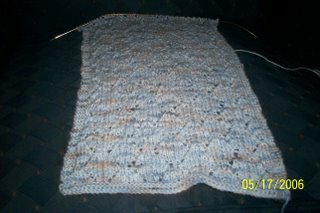 But I did want you to see the finished stole in all it's alpaca glory. It worked out perfectly. Nothing like a little pressure to make you finish a project! Unfortunately the colors don't show up very well due to inadequate lighting. They look somewhat muddy, so I am hoping beyond all hope that there will be some sun sometime in the very near future so I can take it outside and really show off the gorgeous combination of blues, greys, and tans. That and the fact I'm wearing it to a wedding tomorrow and it would be nice if the ceremony could be held outside as planned. 1. A pair of matching hooded pullovers for the girls in a pink rayon/silk blend recently acquired? 2. The "short snort" tank for Miss Emma Bo from leftover Knitpicks Crayon? 3. Perhaps something easy and stashbusting? A pair of mittens? Socks? A baby hat or three? I don't know. I do know I have to get dressed and ready to make the rather rainy walk to the bus stop. So far I've got 47 inches done. I need at least 60. 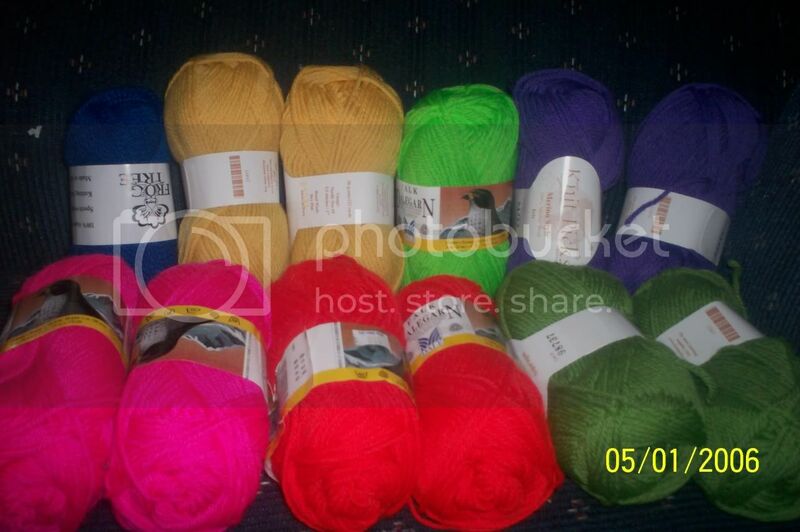 The good news is I have plenty of yarn. The bad news is I really have to finish knitting it tonight so that I have time to wash and block it tomorrow so that it will be dry on Saturday. The wrap with two days to go. Shouldn't be talking. Should be knitting. Here it is. I've got about 25 inches done so far and I know I have to get to at least 60, probably more to go around my arms. Why am I here? I have to knit! Okay, it's Monday. I have until Saturday at one o'clock to get this done, washed and blocked. It is going to be a wrap/stole sort of thing to cover my arms at a wedding. It is my 100% alpaca from yesterday. I forgot to allow for how long it takes to wind 664 yards into a ball without a winder and swift, then I had to frog after the first pattern repeat because it was FUBAR. So, here' s what I have so far. The pattern stitch is called "lacy wheels". A wet day for man and beast! Just got back from the NH Sheep and Wool Festival. For starters, let me say that it was raining all day. POURING. Buckets and buckets of rain. And for a sheep festival, I saw three sheep dogs, three alpacas, and two sheep. I think the animals were called on account of rain. I did get a shot of two sweet lil' alpacas and another of Ma and Sister in the downpour. I like to think the torrents of rain of biblical proportion added flavor to the day. 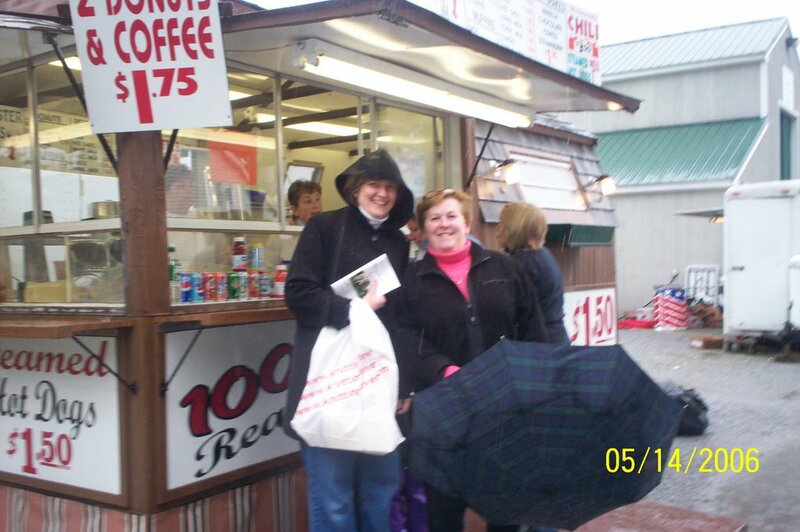 But the vendors were out in full force! Want to see what I got? Of course you do, silly! This is 100% alpaca from Maple Creek Farm. The color is called "Rhapsody in Blue." There's more than 600 yards there, for which I paid 34 dollars. 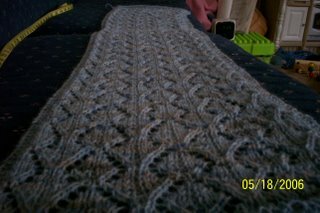 It is going to be a lacy stole which I hope to have done in time for my cousin's wedding on Saturday. I think I can do it. As soon as the kids are in bed, I cast on. This is 100% angora from Acker's Acres Angoras. It's a nice hank of natural brownish color and five tiny balls of colored angora to go with it. I'm thinking mittens for the girls. The whole lot cost me 25 bucks, but it was worth it. I wish you could feel how soft is was. One of her "neighbor" vendors had cashmere at a great price, but I resisted. It worked out well because I got all that fabulous alpaca instead. This came from the lovely people at The Fiber Studio. It bills itself as "silk rayon" and came in this gigantic hank...8 oz. or so, I think for eleven dollars. It knits up with almost a terrycloth feel about it, but softer. I'm thinking summer hoodies for the girls. 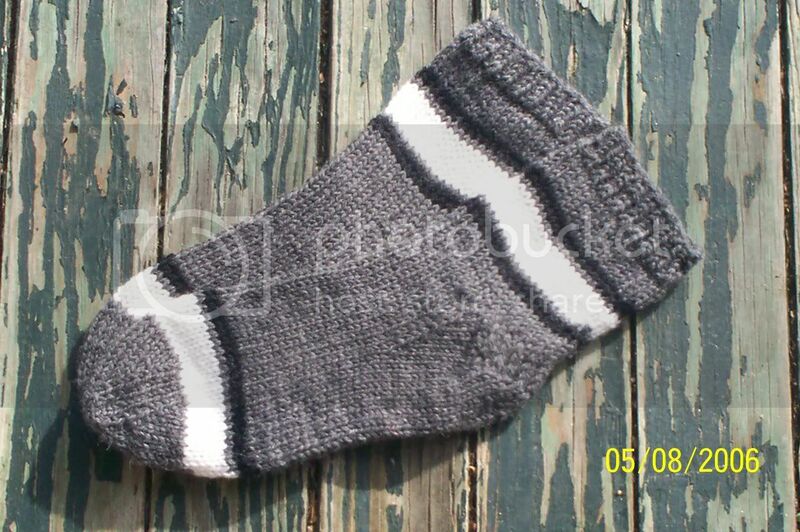 This one is called "Zephyr" from The Elegant Ewe. 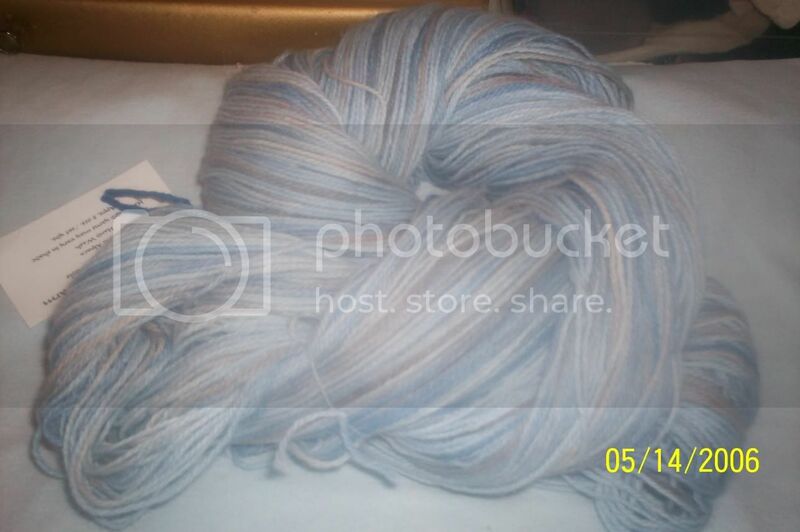 It is 50% merino and 50% tussah silk. There's 600 yards here in ruby. Gonna make a nice lace scarf for someone special. I just don't know who, yet. Twelve bucks. These three small skeins were a steal! Handspun by Ewe and I Farm, I paid 6.90 for all of them. They're only small amounts, but I like to use them as color accents in socks and mittens and hats and things. So I don't need much. I was also intrigued by the drop spindle spinning. One lady was nice enough to show us how to do it and now I'm thinking I may have to try it. Just what I need, another hobby! 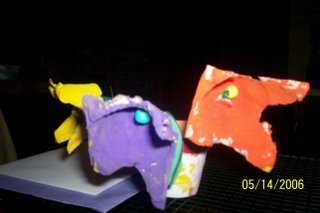 And finally, as proof that craftiness runs in the family, my Mother's Day gift from the Bug. She made it herself and I shall treasure it always. I don't know if I mentioned it here or not, but my Local Yarn Shop (LYS), The Yarn Shop is closing its doors for good, probably at the end of this weekend. It's sad. 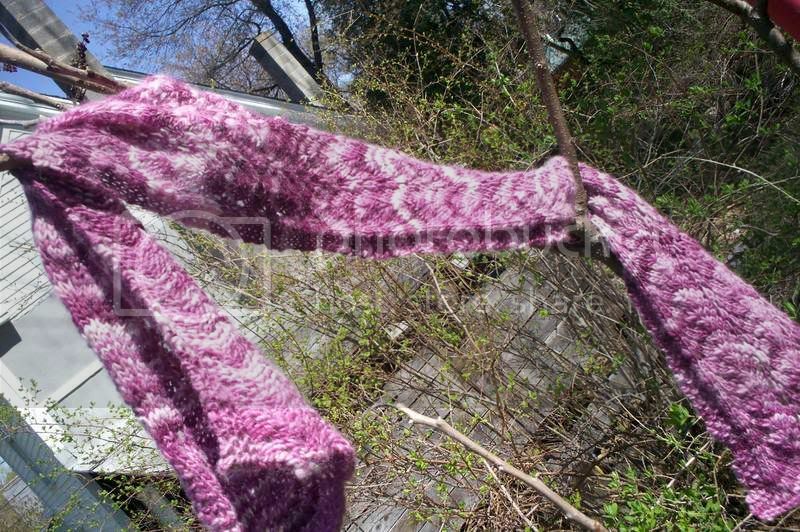 I learned to knit there, and the owner was a friend of mine before she passed away. Hence, the closing. There is 13 skeins of Encore Chunky (keep reading...more about those later) and three of Encore Worsted, three Marks and Kattens MiXiT which I've already earmarked for a scarf, three different skeins of Dale Heilo, a Plymouth Bulky something or other, and a random skein of sock yarn in dark green and a random skein of Alpaca, also in green. Oh, and five skeins of Marks and Kattens wool blend in a heathered grey. 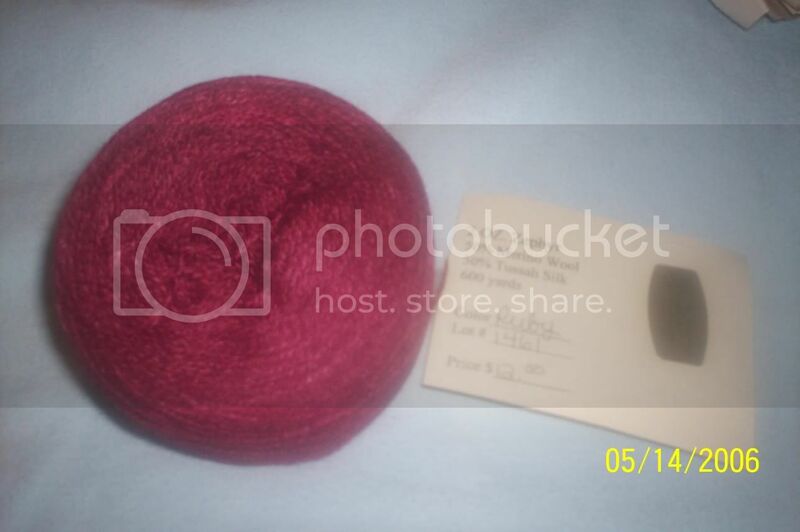 Plus this giant hank of teal yarn that I have no idea what it is, what the weight is, or how much is there. But it's mine! All Mine! 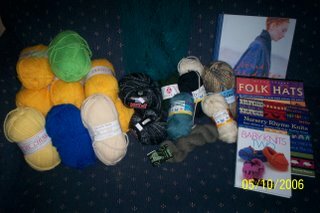 And I got two copies of Baby Knits Two, Nursery Rhyme Knits, Folk Hats, and Norse Strikkedesign. Plus another Monkeysuits pattern and an extra skein of heinous green for the Poncho From Hell. 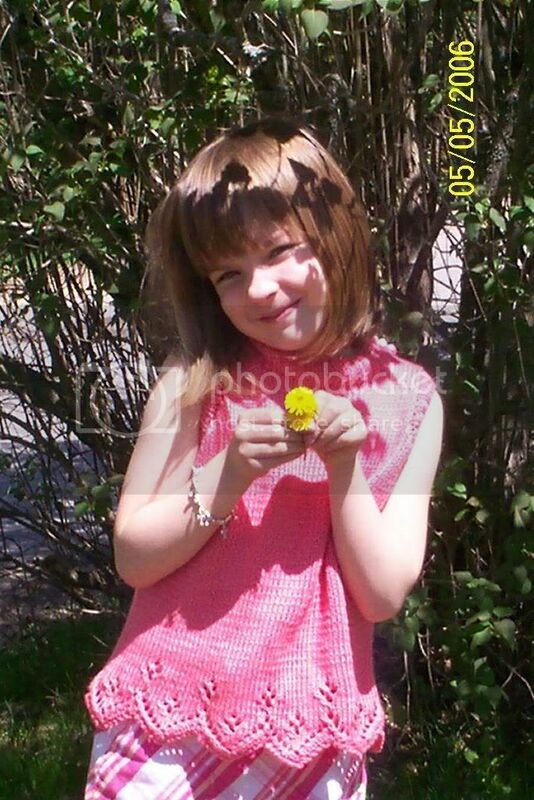 Oh, and some sew in tags that say "made by Mom" and the like. Guess how much I paid for all of that? Go on, guess. Thirty-two dollars. For no less than thirty skeins of yarn and five hardcover books. Not a bad days haul. Now, I have a lot of Plymouth Encore Chunky in color number 1382--Sunny--which is a bright sunshiny yellow. 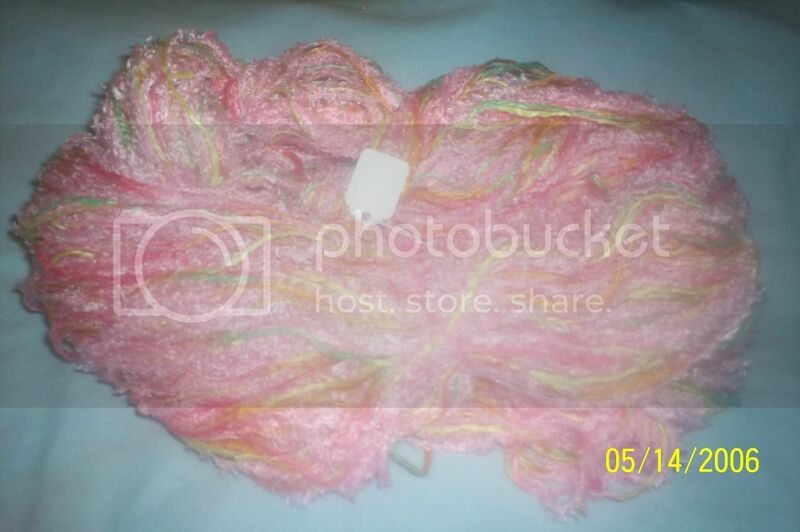 I don't need eleven skeins of the stuff and I'd love to trade it if someone has some skeins of the Encore Chunky in other colors and could use some yellow. Let me know. But now I have to take 32 bucks off the amount I was going to get to take to the Wool Festival this weekend. I guess I can live with that! Joke of the day: What's the difference between a woman in church and a woman in the bathtub? One has hope in her soul. I'm on a sock spree. It's much like a mitten mania, but with socks. 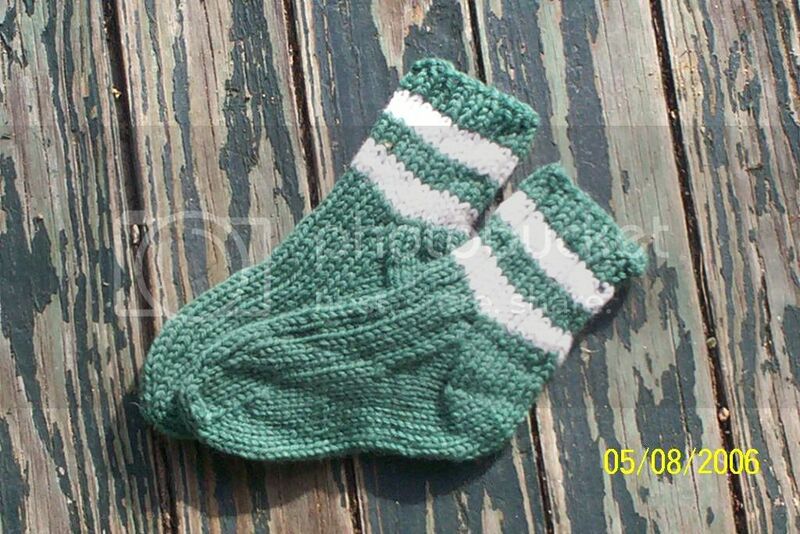 Here's two pair I've made from worsted weight yarn. The grey ones are mostly Nature's Spun Worsted by Brown Sheep and the green ones are mostly Wool of the Andes by Knitpicks. I'm currently working on a pair out of Knitpicks Parade that I got on sale. You know, when I sat down to type, I could have sworn I had more to say. I'm sure I'll think of what it was as soon as I hit "publish". Isn't that always the way? Miss Mary Kate in her new Spring sweater! It is a Sirdar pattern executed in Classic Elite Premiere yarn, 50% pima cotton and 50% tencel. It's so soft! The sheen shows up nicely in this pic, but the colors on my monitor must be off, because it's more of a salmon pink in real life, not as "pink-pink" as it looks to me. So if by chance you're looking at a salmon pink sweater, that's what it should be and clearly you are more adept at adjusting your color tones on your monitor than am I.
I have to keep this picture as proof that she does like to wear pretty things too, even though when left to her own devices she'll pick the most gawdawful colored yarns a yarn manufacturer could ever devise. Though the more I think about it, the more I think her Andean-inspired Poncho From Hell is going to be kind of cute. I mean, how could it not be? Look at that face! She could make anything cute! And the Fug just keeps getting bigger. 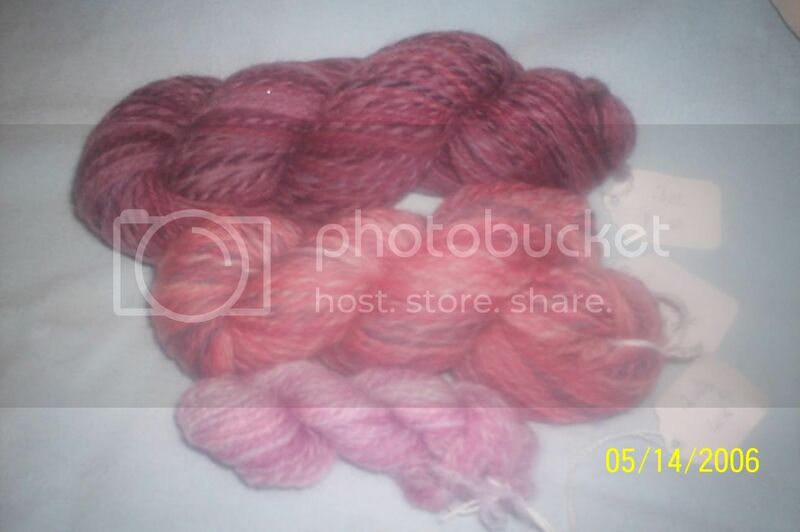 Here's some more yarn for the Poncho From Hell. 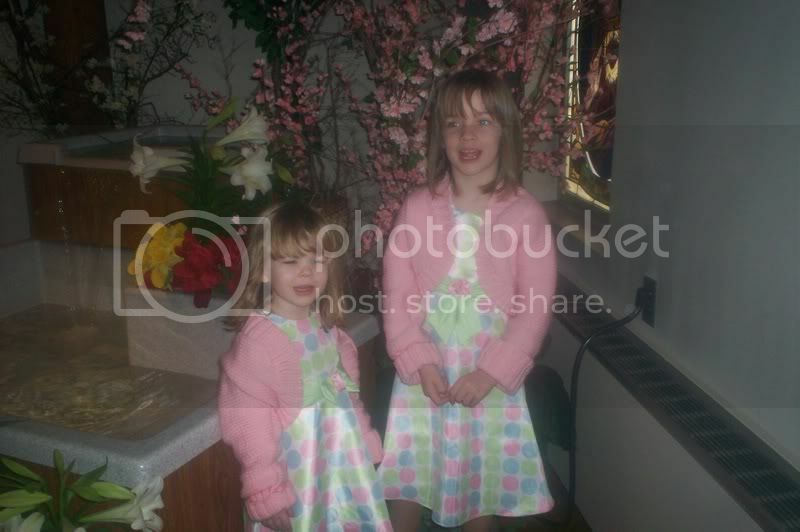 And another reason why one should take pictures in a bright light, even with a flash. Anyway, I got a shipment from Knitpicks yesterday, and that combined with a trip to The Yarn Shop got me some screaming flourescent green (center), bright blue (top left), green and yellow and a kind of bluish purple. The Knitpicks colors aren't anywhere near as bright as they appeared on my monitor, but they should take the edge off the horrifically bright ones I'm using, so maybe it'll all work out. I've been graphing out the design for the poncho, trying to make the patterns fit into stripes that increase as many as 8 stitches over the course of the stripe. But all that "mousing" makes my wrist hurt, so I had to give it a break. Oh, I've got it bad. I'm living on Claritin-D these days, though I'm not convinced it's doing all that much. I actually don't feel too bad this morning, probably because it's raining like a mother out there. Keeps the pollen down. One discovery I've made about decongestants/antihistamines: they do not combine smoothly with singing. Got into church Saturday night and my throat practically closed up when I started to sing. I had to keep a cough drop in my cheek for most of the mass, just so I wouldn't cough myself to death. But I made it through, with no voice to spare. Last night was our weekly rehearsal and again, I pushed my voice to the max. It'll be my own damn fault when it's gone completely. It'll serve me right. And since there are long down times when the other parts are learning their notes, I think I'm going to bring a sock or a mitten or something to knit on while I'm waiting. Something mindless I can knit while I sing without messing either up. 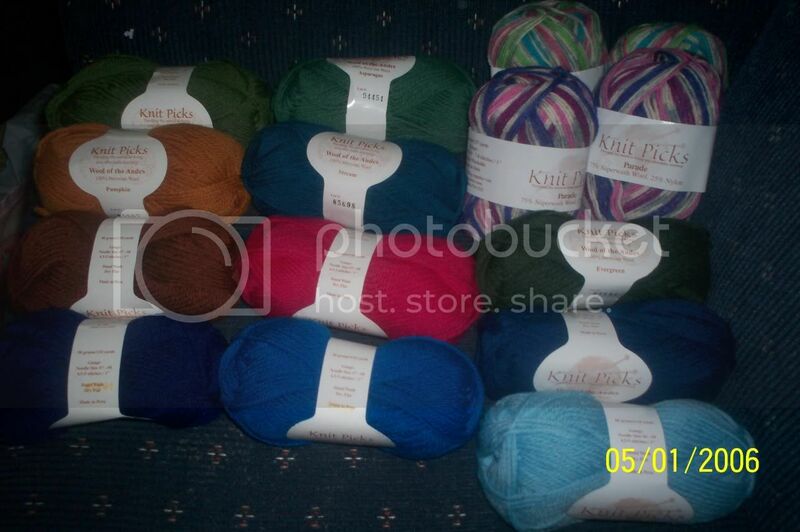 Oh, and I almost forgot that I got all kinds of new yarns from Knitpicks for my stash as well. 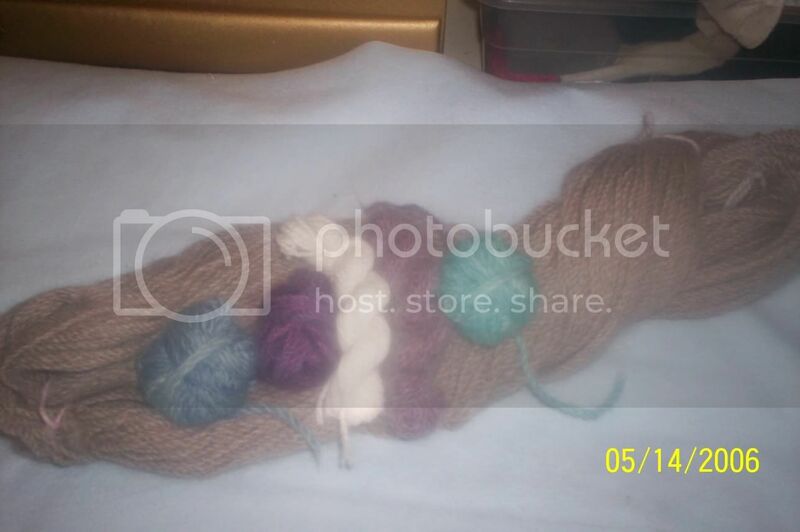 I'd love to show you the picture I took of the 11 colors of Wool of the Andes that I bought, but for some reason, Blogger won't let me upload more than one picture into a blog entry at a time. Which is probably just as well, since the picture came out pretty dark anyway. What a moron. You can see them here. 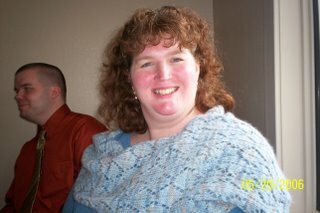 I finished the salmon-colored sleeveless sweater that I was working on! 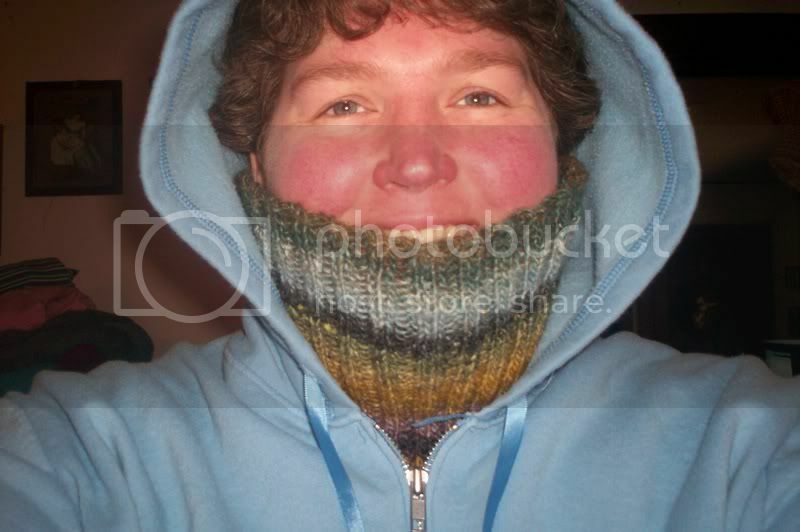 It came out perfectly, except the top neck ribbing didn't fit over MK's enormous head. So I opened the side neck seam and added three little pearl buttons with single-crochet loops, and now it's just right. It's blocking at the moment, but when it's dry I'll put it on the Bug so as to take a picture. 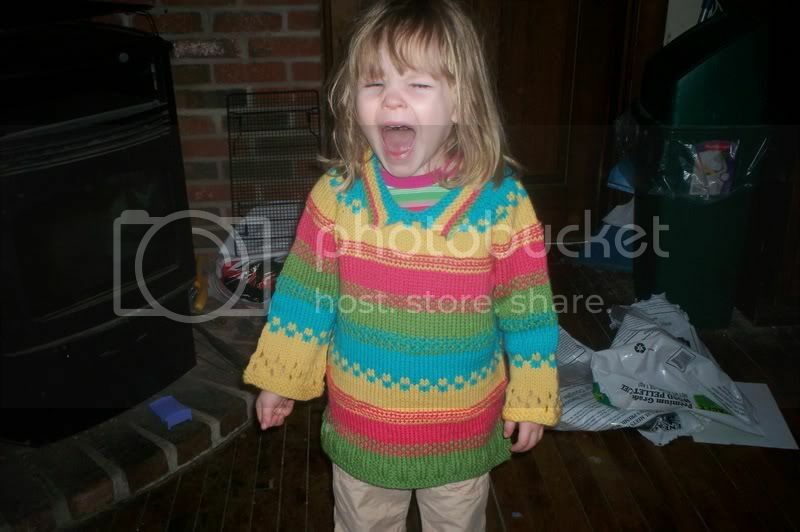 I may send her to school in it later this week when it warms up a tad. It may take that long for it to dry. Freakin' cotton. And I finished it with just enough yarn left over to seam the sides. Talk about a close call!